Welcome to Durham - now where can I go? 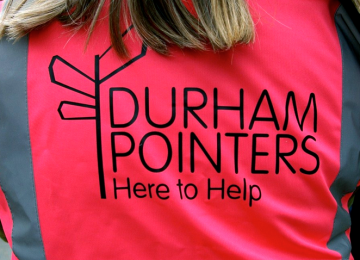 Visitors arrive in Durham, an historic City with a World Heritage Site, but there is no-one to meet them and help direct them round town - but the POINTERS can! We had a trial in 2012 of the concept of the Pointers - a group of local volunteers of all ages prepared to give up 2 hour blocks of their time to welcome visitors to the City Centre. 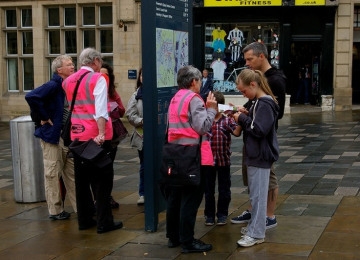 Resplendent in their distinctive pink tabards, they act as a mobile signpost to direct visitors around our City which, due to the river winding its way around the historic peninsula, can often prove quite disorientating. 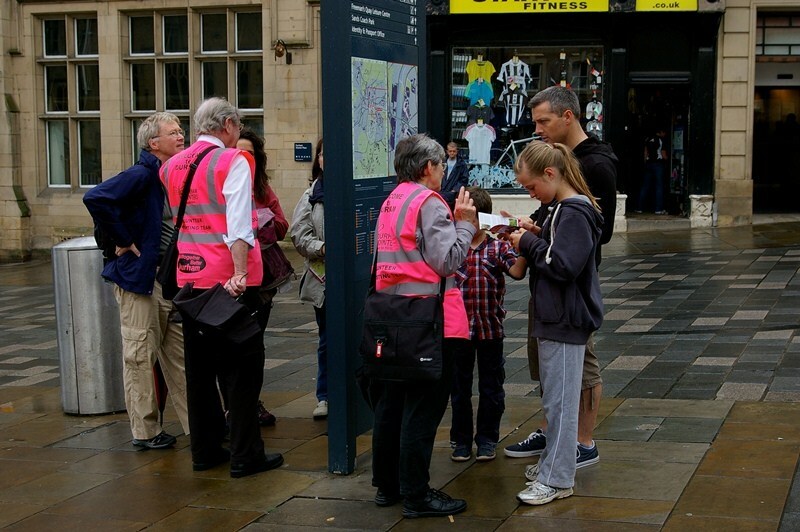 The trial project was deemed a great success and we would like to extend the scope and the numbers of Pointers to further improve the service by meeting and greeting coaches as they arrive in he City between 9.30am and 11.30am with a short welcome address, a city centre map and answer any questions. 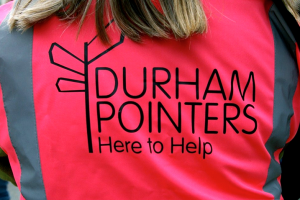 Thereafter the Pointers would be based in the Market Place from 10am - 3.30pm to act as a face to face welcome as well as a mobile signpost for all visitors to the City. Pointers are local, knowledgeable, civic minded, and proud of their City and welcome the opportunity to give something back. Durham is a reginal and national tourist attarction but due to Council cut backs it no longer has a Tourist Information Office where visitors can go and speak face to face with the highly qualified staff who used to frequent the building. As technology has moved on the City has a telephone hub where operatives can answer your questions. 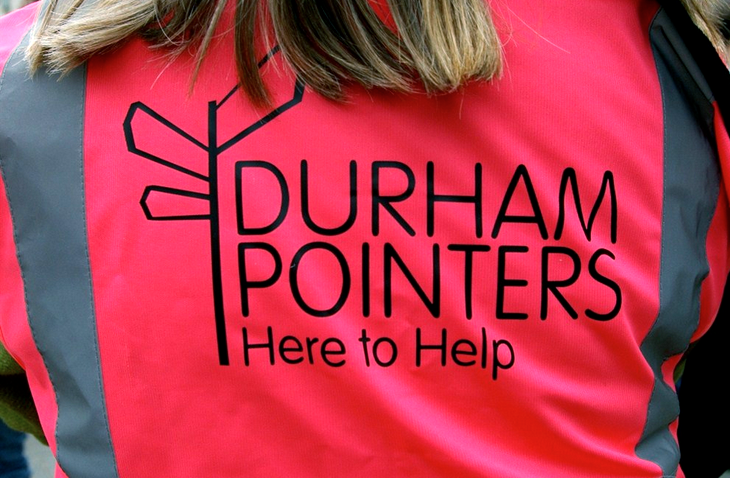 The Pointer seeks to restore the face to face element of a warm welcome to Durham by meeting groups and visitors and helping direct them round the City Centre, which although small is still nevertheless very confusing with its peninsula in the middle of it. We have in place the opportunity for a room from which we can operate in 2013 and have the sponsorship for our public liability insurance, radio handsets and pink tabards in place. We already have a pool of interested (and interesting) volunteers who all have a love and knowledge of the City Centre and are prepared to put a bit back into the Community, recognising how important the tourism and visitor economy is to the City but we need to increase awareness of the concept further to attract even more volunteers as well as being able to fund a part time administrator to pull it all together. Project Delivery Manager: Colin Wilkes The Project Delivery Manager takes legal responsibility for receiving and spending the funds raised and ensuring the project is delivered. 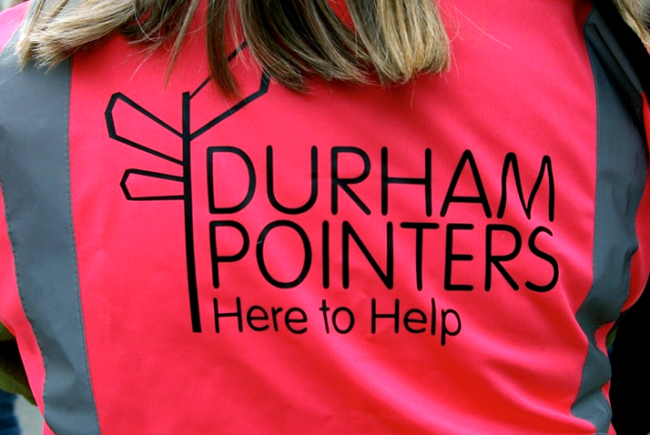 Contractor: Durham Markets Company Limited The team responsible for building or installing the project.